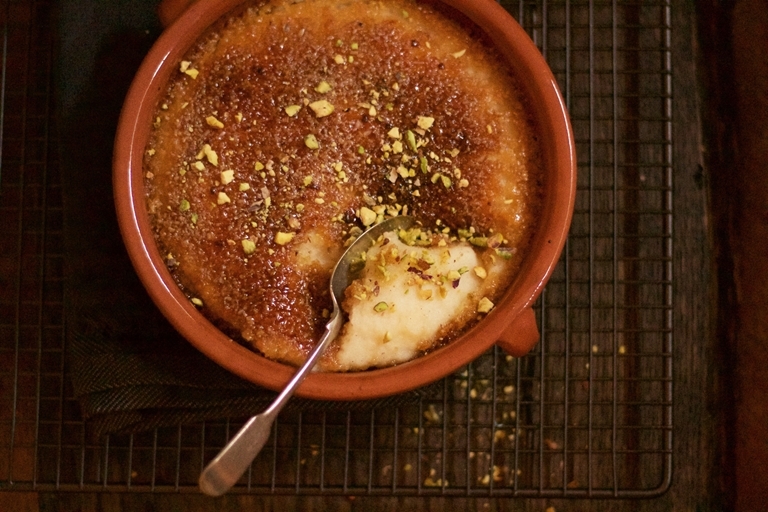 Sumayya Usmani serves up a warming ground rice pudding recipe, reminiscent of childhood desserts in Pakistan but adapted to the chilly British winter. Infused with apple and ginger juice and cardamom, this is packed with comfortingly mellow flavours. Based on a comforting memory of growing up on a ground rice called Firni, traditionally scented with cardamom and rosewater, this dessert was a childhood treat. Usually served cold because of the intense heat of Pakistan summer, I have always wanted to use ground rice to create a more winter-based pudding, something that would be just as comforting as the original but translate for cold British winters. Here using apple and ginger juice adds a kick of flavour that balances the vanilla and cardamom intensity in the ground rice. The apple juice also adds sweetness that balances against the caramelised Demerara crunch. The result is a warming winter pudding that would serve quite well as an end to a festive meal this winter.